Zomato Gold Membership is a new initiative of the most renowned online food ordering website Zomato to pamper their consumers. So, the subscription plan is divided into 3 categories. Now, let’s check out the prices, benefits, and offers of Zomato Gold membership. What do you do when you feel extremely hungry late at night? Well, of course, you won’t step out to have some food, can you? This is when you buzz onto Zomato, find a restaurant, and get order some steaming and delicious food which is lately delivered to your doorstep. With the everyday innovations and latest zomato coupon codes, this online food delivery website is ready with its Zomato Gold Membership. The membership will allow the consumers to lay hand on complimentary dishes and drinks across all the restaurants. Keep on reading to know more about Zomato gold subscription and Zomato gold prices. Do you ever crave for eating any dish which seems to be so delicious and tempting but then you hold yourself back because it’s too costly? Now with Zomato Gold Membership, you have the privilege to order any dish across the whole menu for free. Basically, Zomato Gold is a membership program in which the consumers can avail exclusive deals at the Gold tagged restaurants, bars, lounges across the country. The subscription of the Zomato Gold membership will also allow the consumer to order any two complimentary drinks(alcoholic and non-alcoholic). The Zomato Gold membership program is available in two packages i.e. 12 months plan for all days on a 1-year subscription plan for weekdays only. Customers can purchase the membership directly from the Zomato app or website. The membership is currently available across ten cities including Delhi NCR, Mumbai, Bangalore, Pune, etc. and soon will be launched for other cities as well. Customers can choose from two different types of the membership program. Gold for dining out and Nightlife. One of the most basic Gold membership plans is the starter pack which is applicable only 3 times. You can take the perks of being gold member three times at any partner restaurants of Zomato. The prices that you are required to pay is Rs.300 only. The best part is there is no expiry date of membership. On taking the subscription of Zomato gold membership unlimited pack then you can enjoy food and drinks for free and there is no limit of usage. You can enjoy the perks without worrying about the count of usage. But it is valid only for 1 year. 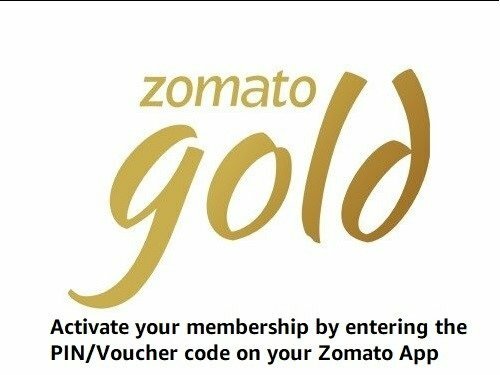 How to Get Zomato Gold Membership? Share is care, this statement truly fits on Zomato refer and earn program. You can get 20% off on your Zomato Gold Membership if you use a referral code given by your friend at the time of checkout. Well, when your friend takes a Zomato gold subscription then he/she will receive an option to refer your friend. When he will share this code to you, and if you use the referral at the time of checkout then you will receive an instant discount on your membership plan. 2. How to get Zomato gold membership for free? We all look for discount and deals when it comes to buying something online or taking plans online. Don’t worry you can also find cashback offers and Zomato gold promo code for taking Zomato gold subscription at lesser prices. There are several ways in which you can get discount and deals on your Zomato gold plans. The Zomato Gold subscription is like a silver bullet for foodies as it will open all the doors for getting free delicious food and drinks on your visit to a restaurant that has been partnered with Zomato. Now, let’s take a look at such ways of getting membership in free. If you want your friends to take advantages of Zomato Gold then you can send a Zomato Gold gift card from Amazon’s website online. This offer is initiated by Amazon to connect more foodies together. Even there is an advantage of sending an e-gift card to your friend as you can get flat 10% discount at checkout. Even you can write a message for the recipient as well as this will consider as your Zomato Gold Membership review. Adding on, this Zomato Gold Invite code Amazon offer is valid till 11th July 2019 and your membership will be 12 months after activation. Note: The Zomato Gold membership purchased on Amazon.in cannot be returned/refunded. Get yearly membership of Zomato Gold at Rs. 950. The Zomato Gold offer is applicable for Axis Bank users. Use the coupon code "AXIS1200" to get discount on Zomato one year membership fee. Valid once per customer, not valid for existing Axis Bank card customers who are already Zomato Gold members. Would you like to save your Rs.125 on the Zomato gold subscription by just using a promo code? I think who would deny for catching this golden opportunity. Well, if you choose Paytm as your payment method then you can enjoy a flat Rs.125 cash back on your Zomato gold membership. Besides this, you can also get 10% additional discount on your online order from Zomato website/app if you pay using Paytm. Also, check how to apply Zomato coupons and get up to 50% off on every order. How to Avail Paytm Cashback on Zomato Gold Membership? Where is Zomato Gold Membership available? As discussed earlier, Zomato has started a subscription-based service named as “Zomato Gold”. This service allows a user to enjoy complimentary free drinks and foods in their favorite restaurant. Started in the three major cities of India but now expanded to 10 most popular cities of our country. This means, more and more people can take the advantages of this membership. Also, here I have aggregated the list of cities under which th Zomato Gold Membership is valid. If you’re planning to meet with your social circle for drinks then visit any pub or bar that falls under the Zomato Gold restaurant umbrella and you can enjoy two complimentary drinks of any cost for free. The membership provides additional benefits like invitations to the exclusive events at restaurants. The events will include wine-tasting sessions, new menu try-out sessions, food walks, special chef-cook sessions, new restaurant launching and more. Consumers will get benefits like 1+1 dish offer where on ordering one dish, the user will get another one for free. Also, there are 2 + 2 drinks benefits, where on ordering 2 drinks, users can order the other 2 same for free. How does Zomato Gold Membership work? When you visit a restaurant partnered with Zomato gold you will be required to open that restaurant's page on the app. Then, before placing the order, you have to unlock your visit and provide the details to the restaurant's staff. Now, you’re eligible for placing the order and don’t forget to enjoy your complimentary dishes and drinks. There are certain terms and conditions which you need to carefully understand before purchasing the membership plan. Read the below-given points carefully so you don’t miss anything. The Gold privileges will not be applicable on special occasions including New Year, Christmas, Valentine’s day and so on. Zomato is the most trusted app for ordering food online. Their unique money saving offers and deals actually help customers to save a few bucks on their every order. Zomato is known for its tie-ups with premium restaurants and Zomato online order offer, the assurance of food quality, and hassle-free customer services. Adding on, the launch of Gold membership brings huge benefits for the Indian consumers. Now, the consumers have the chance to visit premium restaurants in your city, pubs, and lounges during the night time and a major benefit as they can enjoy complimentary drinks and dishes. So, what you’re waiting for purchase your Gold membership now. greatsb It is very good idea to use Zomato gold membership reducing your restaurant bills while eating out. You will get very good service just for paying Gold member fee around 200 per month maximum. (If you use promo code and purchase via bank card (ICICI & AMEX), then you can avail more offers and price will come down upto Rs. 150/- per month), also think that if you go minimum at least once in the month, then it will cover up the amount paid by you. There are also other deal providers like freecharge, paytm from such portals also you can buy membership. Also, there are some tricks by which you can get it discounted rate. You will get extra 1 month subscription added using an invite code. Use code SOUR8002 and enjoy your 13 months membership in price of 12 months..! Cheers..!